TRAIN SMART AND DOMINATE THE MARATHON! UrbanHalo founder and marathon running expert Jen Joas shares her personal tips for maintaining good running habits from practicing perseverance, to proper shoe styles, and to the dangers of overtraining. As you’re training for your next marathon, keep these tips in mind to conquer your goal and sprint past the finish line with a smile on your face! Lack of proper running attire. One common mistake runners make is over-dressing or under-dressing. On average, our bodies warm up 15-20 degrees while running, so you have to combine that to the outdoor temperature and dress accordingly. As a general rule, you should avoid wearing cotton while running. Aside from putting you at a greater risk for chafing, cotton stays wet when it becomes soaked with sweat, clinging to your skin and making you uncomfortable in both warm and cool weather. Stick to clothes made of technical fabrics with flat seams (like an UrbanHalo headband! ), as this attire will wick the sweat away from your body, keeping you dry and reducing the chance of chafing. Giving up too quickly. Many of us become inspired to pick up running, only to give up after a short time because frankly, asking your mind and body to try something new can be difficult! Preparing your body for running takes time. Start with a run/walk training program, like the Couch to 5K program. Stick to it and then sign yourself up for a fun race to celebrate the goals that you achieved. Find a buddy to run with, as running at a conversational pace will also prevent burnout, and having a partner is motivating! Set your phone on a playlist that gets your blood pumping and feet racing. Run outside whenever possible and change up your routes for variety. Wearing the wrong shoes. This may be the biggest mistake runners make. I struggled for a few years with shin splints and IT pain before finally discovering I had been running in the wrong shoes. I discovered that you shouldn’t pick your shoes based on the cutest colors or designs! Our stride and shape of our feet are as unique as our personalities, and having the right shoe is key to keeping your limbs injury-free. Head into a local running specialty store to be evaluated and fitted for the proper shoe. Your shoes should also be replaced every 300-500 miles to maintain proper cushioning and support. Overtraining. If you are just starting out or training for your twentieth race, too much is never a good idea. A common mistake made, whether it is race day or you’re out on a training run, is to start out too fast. Keep in mind that you’ll almost always feel better during your first mile than your last. If you begin running too quickly, you may face burnout before reaching your goal. Start out a bit slower than your goal pace for the first mile and gradually increase your speed. If you are just starting out and unsure of what your goal pace should be, run at a speed that would allow you to still carry on a conversation. Another common mistake among new runners is to increase your overall distance too quickly. To prevent injuries, don’t let your weekly mileage increase by more than 10% from one week to the next. Finally, to improve, your body needs time to recover. Always give yourself a day of rest after your longest weekly run and whenever you experience pain during a run. Race day experimentation. Race day will always be filled with unknown variables, such as the weather. New gear, pre-race food or supplements should not be one of them. If you haven’t tried it before the race, don’t try it then…no matter how much that running expert friend of yours raves about the success they’ve had! What works for one doesn’t always work for another. Good luck, and happy times ahead racing! Jen Joas, marathon running expert and mom, offers her words of wisdom for busy, hard-working women. 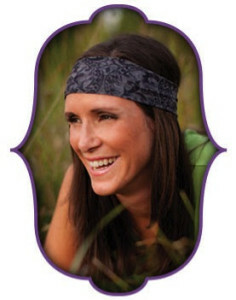 Jen Joas is the founder of UrbanHalo, fun and flirty headbands that are as practical as they are stylish. Jen is well-rounded on all subjects when it comes to mind and body health. She educates on topics such as finding “me-time,” strengthening marital bonds, balancing activities in a healthy way, and making time for work and play, proper running habits, exercise, and proper rest. To keep up-to-date on news and upcoming UrbanHalo products, visit their website and like them on Facebook.